The Mike Holmgren era has officially come to a close, with Holmgren announcing that Friday will be his last day on the job as “official” president of the Cleveland Browns. Holmgren has been unofficially off the job ever since Joe Banner took over as CEO (some would say he’s been off since being hired by former owner Randy Lerner almost three years ago). “This is a great football city,” Holmgren said. “All of the things I said in my opening press conference came true in that way and I fully expect the team to do great things in the future. Those who have been covering the team for a long time can really enjoy it. While Holmgren couldn’t deliver a winning team – and how realistic was it to think that 11 years of complete ineptitude as a franchise could be fixed in three years is a valid question – the team is better than when he took over. He brought structure to a dysfunctional franchise and now the Browns at least appear to be an NFL team, with a functioning general manager, a coach (we’ll leave it up to you to decide how functional that position is) and, most importantly, everyone knowing their roles within in the organization. Could Holmgren have done more? Of course; when you are a perennial five-win team then there is obviously more work to be done. Some of that falls on former owner Randy Lerner, though. Once Holmgren brought order to the front office, he really didn’t seem to know what to do next and Lerner should have given him some clear instruction on what his job was (of course, if Lerner did that the Browns may not be in the situation they find themselves in today). It’s pretty obvious – at least in Cleveland – that Holmgren missed on hiring Pat Shurmur as a first-time head coach (although we have no idea what the national media is thinking) but he seems to have made a solid hire in general manager Tom Heckert. And while many will criticize Holmgren for the tone he took with the Cleveland media, that never bothered us, especially since too many media members felt entitled and treated Holmgren like he was hired to be at their beck and call. Or else they assumed he would coach the Browns and felt betrayed when their assumptions went unfulfilled. 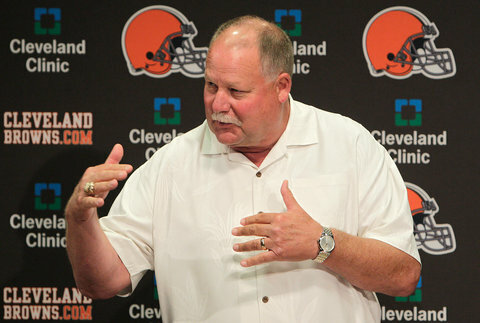 In the end, the Browns didn’t win enough and it is probably for the best that Holmgren moves on. He is a direct tie to Lerner and exorcising another link to the Lerner era can only be a good thing. A day later and it’s fun to hear the Browns talk about a game where they actually beat the Steelers. As good as it feels to see the team finally beat the Steelers, imagine what it will feel like if the Browns can’t beat Oakland on Sunday and actually have a winning streak? Not so great is the early news on quarterback Brandon Weeden, who may miss the Raiders game after suffering a concussion against Pittsburgh. To be able to play, Weeden must be cleared by the Browns the team physician as well as an independent neurologist. The fact that the Browns play on the West Coast, rather than at home, for their next game may also factor into the decision. As Jamison Hensley points out at ESPN, some doctors recommend that people who have suffered a concussion should avoid flying for two weeks. If Weeden can’t go, then the Browns will turn to Colt McCoy.